After twenty-one years of a quiet, conservative lifestyle in the Gold Wind pack, Hana Hawthorne's world is flipped upside down. Change seems inevitable once her mother is tragically killed, but she never expected this change to uproot her from the only pack she's ever known. Alpha Wyatt Windsor of the Blue Mountain pack was one of the most powerful Alphas among the seven packs. Known for his stern personality and strict rules, it's no surprise that at twenty-six he still had not found his mate - his pack's Luna. With rogues attacking for the first time in over a decade, Hana and Wyatt discover their lives are intertwined in more complicated ways than they could have ever guessed. What do you do when your parents are the Alphas of the pack and are killed trying to save you? Most packs would stand behind the child of the Alpha and support them during their loss , but not Twyla' s pack. They turn on her making her the omega and their slave , and for two years Twyla' is subjected to the worst hell possible forced to become nothing but skin and bones. Losing all sense of hope and blaming herself for her parents death Twyla welcomes the thought of death and has given up on ever finding her true soul mate. Even when the pack is in an uproar at the arrival of the legendary Alpha Aries, Twyla knows it will just mean more work for her and another hand to beat her . Alpha Aries is legendary for his power and enormous pack in the southern United States from Virginia to Texas. After 50 years in his prime Aries has all but given up on the thought of ever finding a mate ,and has put all his effort into a peace process for all werewolves. But what will happen when the first pack he visits for peace is Twyla's and she is his mate? Will Twyla accept Aries as her mate or will her past separate them? And what will Twyla do when the secret her family has been holding this entire time finally comes to light? Carter is unlike any other girl you know. For one, she's a werewolf! But also she can go from 1 to 100 in 10 seconds flat. She isn't afraid to fight for what she's wants and is willing to do anything for her family. Carter has always wanted a mate, she's loves the idea. But what happens when Carter's mate is the future Alpha King? This is A very rough draft! This book is in dire need of editing! I would like it if you stuck around later for the rewrite but meh! It's your choice. Read at your own risk. Deep in the woods, where even the strongest of men feared to enter, lies a pack built upon the omission of a history that started it all. There she lived, naive and hopeful. Her saccharrine smile and gray eyes,  a beacon of hatred as she was shunned by her own people. Lyra, a she-wolf of beauty and innocence had been through a lot. With only the words of her adoptive father and two older wolves whom she treated as her own brothers, she emerged with a smile. But as the moon shined with power and revealed who she was bound with, her heart is crushed into a pieces as she soon discovered what a broken heart feels like. Try as she might, even if she had left her old life behind, a wolf had stumbled upon her, taking her back from where it all started. And the omitted truth start unravel. Unveiling the truth she was not expecting. No parts of this book shall be reproduced, copied, or recorded without the owner's consent. This book is the product of the author's fictitious mind. Names, places, and events that may resemble to a real one is pure coincidence. At age twenty-one, Skylar Bellemore loses all hope of finding her destined mate. After three years of seeing other wolves her age meeting their mates from near and far, she decides it may be time for her to move on. That's when she meets Bennett Price, a man around her age whose destined mate had passed away a year prior. Now, Skylar and Bennett have been together, happily in love, for four years, and the two of them couldn't imagine things any other way. In fact, Skylar is convinced that whoever her destined mate is, couldn't possibly compare to Bennett, and she no longer has any interest in ever meeting him. Bennett, on the other hand, worries every day that his chosen mate may run into the man she's destined to be with. Although Skylar assures him that nothing could ever come between them, could she really be so sure? Alpha Zane Warwick had never had much interest in finding his mate. He didn't necessarily dislike the idea of having a mate, but it wasn't a top priority for him. That is, until his father, former Alpha Cedric Warwick suddenly falls ill and passes away. With no Luna or former Alpha, the Night Fire pack becomes the weakest and most vulnerable it's ever been. Between Zane's deep hunger for power and his father's dying wish for him to find his mate, his pack's rightful Luna, Zane has no choice but to actively search for the she-wolf the Moon Goddess destined him to be with. Audrey Allen had lived her entire life in the Dark Root pack, and every minute of it had been dreadful. Well, perhaps not every minute of her life, but every moment she had endured since her mother's death ten years ago had shaped her into the pathetic excuse for a woman that she was today. Or at least, that's how she viewed herself. A decade of neglect and abuse would do that to a girl. All Audrey believed she was good for was cooking and cleaning the pack house, and her father had her doubting even those abilities. Alpha Dean Whittaker had ruled as Alpha of Dark Root for eight years by himself. Although he secretly craved his mate, his Luna, to appear in his life and allow him to strengthen his pack even more, he knew his chances of ever finding her were slim. He was feared by both his own pack members and surrounding packs, so even if he ever did find his mate, he'd likely have to force her to stay. Not that that'd be a problem - Alpha Dean did as he pleased. When a chance encounter brings Audrey and Dean face-to-face, both of their lives are turned upside down. As they endure the new challenges life has presented them, they find that they possess the ability to either come together, or tear each other apart. 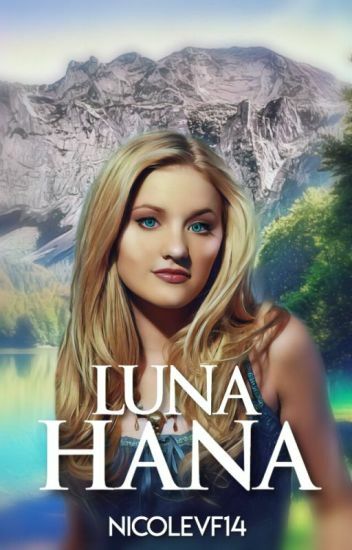 Luna Audrey - The third book in the Lunas series. Olivia Fenris is the only girl ever born with Alpha blood and she's determined to take over as Alpha, but a few obstacles stand in her way - very few people support her and she's in love with the most lethal Alpha there is. The running never bothered her - she had run her entire life. From what? Nothing in particular...at least not that she could remember. The only real threats in her life were accidentally stumbling onto an Alpha's territory, or encountering a male rogue who was a disgusting prick. Although the first option seemed completely unfathomable, Lena Moretti's life as a rogue comes to a screeching halt when she finds herself inside the territory of the Polar Moon pack. Alpha Elijah Perrin of the Polar Moon pack is known to outsiders as "the cold one." No one was really sure why or how the Alpha had earned such a title, himself included. After all, didn't it seem a bit odd for someone rumored to be so heartless to search the seven packs high and low for years in pursuit of his beloved mate? Or perhaps not having his mate is what made him cold. When Lena and Elijah cross paths, both of their lives are thrown completely off balance. The two of them challenge each other's expectations and uncover truths that they never could've imagined. ❝"Elijah, stop please!" I cried as my mate kept landing blows on him. If he kept doing that he would certainly kill him. He growled angrily as he threw him against a tree. With a clenched jaw he stalked towards me. Parker always expected that her mate would reject her. After all that's what everyone always told her. She was just the Omega, the pack slave. So imagine her surprise when, Elijah North, soon to be Alpha doesn't reject her. But no, he doesn't really accept her either. He keeps toying with her heart and Parker isn't sure just how more she can take. But then the Alpha of the visiting pack shows interest in her and a side of Elijah she had never seen appears.